Grilled Beef Flavored Hotdog Bar is an innovative, new canine snack suitable for the modern lifestyle of the contemporary generation. The delectable treat is made from real chicken mixed with beef, and comes in the shape of a stick with high-quality casing. This makes it highly portable and easy to store and maintain excellent quality and flavor without refrigeration. Dogs of all breeds love them! Grilled Beef Flavored Hotdog Bar is made from imported beef from Australia blended with real chicken meat, creating a mouthwatering taste and delightful aroma. This snack has been precisely prepared by our highly experienced expert team and has been meticulously researched and tested in the laboratory to ensure that the snack is hygienic, safe, and filled with all of the nutrients man’s best friend needs to stay healthy and happy. 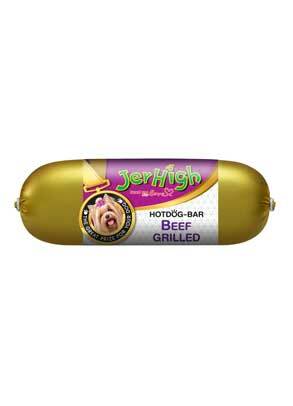 You can rest assured that Grilled Beef Flavored Hotdog Bar has everything your pet needs to stay full of energy, good health, and happiness.